Dextroscoliosis is one of the more common scoliosis curvatures and, depending on the degree of severity, it gives the spine an “S” or “C” shape. This form of scoliosis typically affects the thoracic spine region and usually develops in children between the ages of 10 and 15 when they go through their first growth spurt. 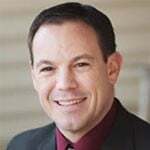 It can also be triggered by various muscle or connective tissue disorders later in life. The symptoms of dextroscoliosis include uneven shoulder height, asymmetrical shoulder blade or rib prominence, uneven hips or waistline, and a noticeable curvature of the spine. In more severe cases, the abnormal curvature may cause the patient to tilt his or her head, or to lean the entire body to one side. Depending on the degree of curvature, dextroscoliosis can compress the organs, which can lead to problems with breathing and circulation. It may also cause pain in the chest, legs, or back. Unfortunately, as many as 85% of scoliosis cases are idiopathic, meaning they have no known cause. In the other 15-25% of dextroscoliosis cases, the condition is either congenital, neuromuscular, or age-related. It can affect anyone, but it is most prominent in preteen and teenage girls. 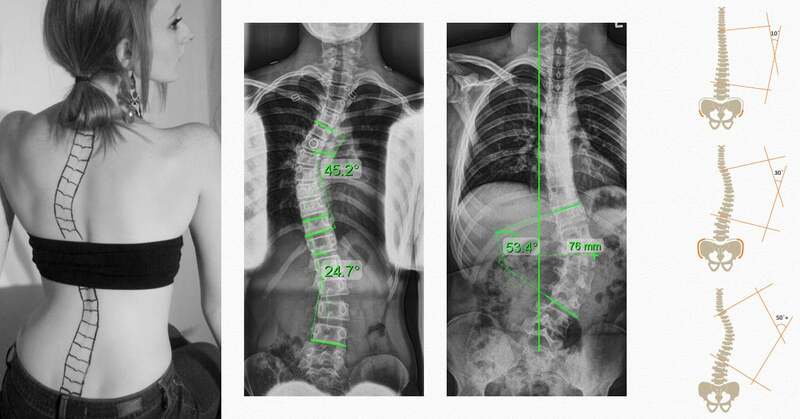 Dextroconvex scoliosis is characterized by an S-like curvature of the spine, specifically in the lumbar region. This type of scoliosis is also known as lumbar dextroscolioisis or dextroscoliosis of the lumbar spine. When the curve is very slight, about 10 to 20 degrees, it is sometimes called mild dextroscoliosis. This term doesn’t refer to the severity of symptoms that may be associated with the spinal curvature; it refers to the degree of curvature in the spine. 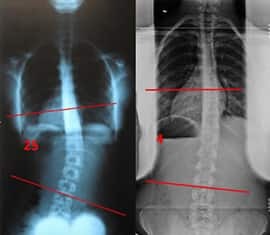 Thoracic dextroscoliosis is characterized by an abnormal curvature in the thoracic region of the spine, in which it curves laterally to the right. As is true for lumbar dextroscolioisis, mild thoracic dextroscoliosis typically refers to a curvature 20 degrees or less on the Cobb angle measurement scale. Although this form of scoliosis can be mild, it may still cause pain and other symptoms. It is also possible for the curve to progress over time. The opposite of dextroscoliosis, levoscoliosis is characterized by an abnormal sideways curvature of the spine that goes to the left, known as levocurvature. While this form of scoliosis typically affects the lumbar spine, it may affect the thoracic spine in some cases. When the thoracic spine becomes involved, it can compress the organs and lead to problems with the heart and lungs. In mild cases, levoscoliosis may not produce any symptoms and can potentially resolve on its own; in more severe cases, it may cause asymmetry with the shoulders and hips, as well as breathing problems. It isn’t usually a painful condition. There is no specific cause for levoscoliosis, but in many cases, it is a condition present at birth (known as congenital scoliosis). It can also be secondary to various muscle and tissue disorders like muscular dystrophy. Presence of levoscoliosis in the thoracic spine is often a strong indicator that a tumor is growing on the spinal cord. Diagnosis can be made using x-rays while MRI and CT scans can be used to determine the severity of the condition and its impact on the internal organs. Levoconvex scoliosis, also known as thoracic levoscoliosis, affects the thoracic region of the spine and is characterized by an abnormal lateral curvature that goes to the left. As is true for other types of scoliosis, levoconvex scoliosis can range in severity from mild to severe, but the curvature is typically limited to the T1 through T12 vertebrae. Even so, this type of scoliosis has the potential to affect the rib cage and might cause compression of the organs, which can be dangerous. It is important to monitor levoconvex scoliosis for signs of progression. The opposite of lumbar dextroscoliosis, lumbar levoscoliosis is characterized by an S-like curvature of the spine in the lumbar region. The curve affects the vertebrae in the lower back – L1 through L5 – and the curve itself goes to the left. Like dextroscoliosis, lumbar levoscoliosis is often mild, but it has the potential to progress over time – especially when it develops during childhood or early adolescence. Scoliosis takes many different forms, and understanding the differences is important for determining the proper course of treatment. This entry was posted in Scoliosis Causes, Scoliosis in Children, Scoliosis Symptoms. Bookmark the permalink.